Cornstarch is one of those ingredients that tends to be a bit confusing for those following a whole foods diet. In addition, people pursuing an environmentally responsible lifestyle usually write it off because most sources are from highly sprayed, genetically altered origins. Are these generalizations about cornstarch accurate? Can it ever be safe to use and even helpful? The answer is yes, but the trick is to know what to look for and when to (definitely) use a substitute! Decades of federal grain subsidies in the United States have caused a literal flood of corn and corn-derived additives into the food supply. Yes, corn is a grain. Corn on the cob on your dinner plate does not count as a vegetable! These subsidies render corn incredibly cheap to produce. Hence, farmers love it and manufacturers favor it as an inexpensive and highly useful ingredient for all manner of food and personal care products. Some of the most common uses when in its familiar white powder form include thickening liquids or as inexpensive breading for fried chicken. Manufacturers use it to make corn syrup, which is added to hundreds of processed foods. Many personal care products such as baby powder also contain it as it absorbs moisture very effectively. In liquid form, cornstarch adds crispness and a degree of stain resistance when sprayed onto clothes and then ironed. Mixing it with glue and glitter transforms it into a slimy mixture that kids like to play with. Making cornstarch is not something you want to try at home. The process of separating the starchy endosperm from kernels of corn is fairly complex and most suited for a factory! In addition, the corn used to make starch is very low in sugars. It’s not the typical corn on the cob consumers buy from the store. This special type of corn is left on the cob until it is rock hard. The kernels are then removed from the cobs and soaked for 1-2 days in vats of water to loosen the husks. When the kernels are sufficiently softened, machines process the kernels in a series of steps to separate the starch from the rest of the grain. First, the hulls and germs are discarded. They eventually become corn bran and corn oil. Protein is the last component separated from the endosperm, leaving a wet slurry of water and starch. Talking about “cornstarch nutrition” is an oxymoron. It is the very definition of empty calories! Each tablespoon contains approximately 30 calories – 7 grams of carbohydrates, zero protein, and zero fat. There is no fiber and basically zero vitamin or mineral content. Pure cornstarch is as close to sugar as you can get without actually being sugar! With such a poor nutritional profile, you might wonder why people would ever use cornstarch as a food. This food, while lacking nutrition, still has one big thing going for it – it is gluten free. Hence, for those sensitive to wheat or other flours containing gluten, cornstarch provides a very cost effective alternative as long as there are no corn allergies present. If you are considering cornstarch for any culinary purpose, you really should only ever buy organic. Corn is one of the most highly sprayed crops in the world. And, because almost all corn is genetically engineered to withstand the deadly effects of glyphosate, crops are repeatedly sprayed with Roundup throughout the growing season. As a result, the chances of pesticide residue is very high for corn and corn-derived products like cornstarch. Every little bit of exposure adds up, so stick with organic cornstarch to be safe. Organic brands aren’t much more expensive than non-organic, so price shouldn’t be a deterrent. Corn flour, or cornmeal, and cornstarch are very different foods. 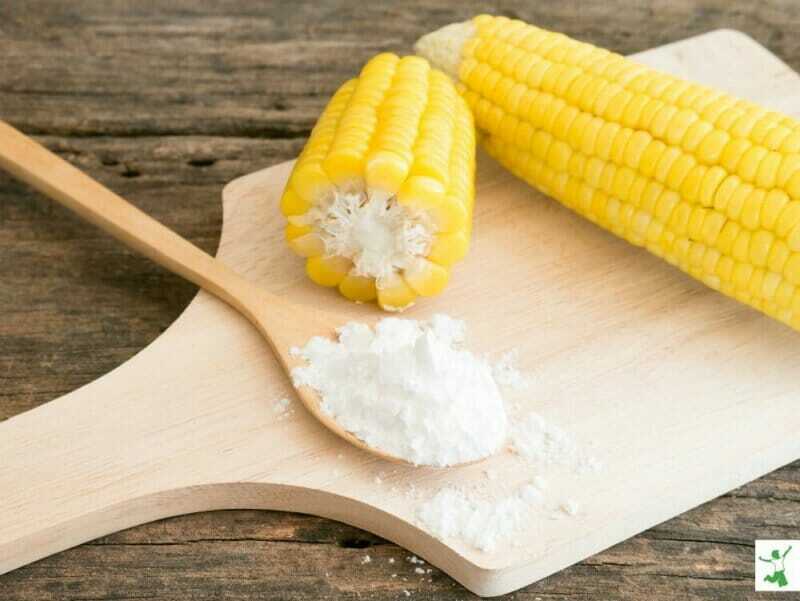 The most important distinction is that cornstarch is a highly refined food because the endosperm is separated from the germ and bran as described above. By comparison, cornmeal and corn flour (called maize in Europe) are whole foods. They are made by simply drying and then grinding corn kernels. The texture can range from fine to coarse. When it’s finely ground, the maize is known as corn flour. When coarsely ground, it is referred to as cornmeal. Hence, if you are planning to make some cornbread, soaked cornmeal is what you would use – not cornstarch. Resistant starch is a beneficial carbohydrate that helps to maintain gut health (and a flat belly!). While not digested by the body, it serves as a nourishing food source for beneficial intestinal microbes. In essence, resistant starch functions much like fiber in the large intestine. Hence, any maize flour made from heirloom varieties would not be as high in resistant starch, although they would likely be more nutritious overall. Highly refined cornstarch would even be lower in this important nutrient. In fact, if you wish to increase the amount of resistant starch in your diet, cornstarch is not a good choice. Potato starch would be the best alternative. Cornstarch uses in the home kitchen are almost exclusively confined to thickening sauces and gravies. The most common method for thickening is to use 2 tablespoons of cornstarch for every 2 cups of drippings. Thoroughly mix the cornstarch with one-quarter cup of cold water (no lumps!) before blending with the drippings and cooking, stirring constantly over medium heat for a minute or two. To make creamy gravy, one-quarter cup of cold milk is substituted for the water. For baking, cornstarch is most often used for savory dishes rather than breads or desserts. In particular, if you enjoy crispy chicken skin, cornstarch is a better choice than corn flour for coating each piece before it goes in the oven. Because it is pure starch, it very effectively seals in the juices and helps with browning. Are you having trouble getting past the fact that cornstarch is empty calories? Even if organic and free of residues, would you prefer to use a substitute with at least some nutrition for all those carbs? Yes, I get it! Actually, I am in total agreement, which is why I don’t even have any cornstarch in my pantry! My favorite substitute for cornstarch for thickening purposes is arrowroot powder. The only downside is that arrowroot tends to lose potency when stored for a long period of time, whereas cornstarch seems to never lose its thickening ability. For coating meat before baking to seal in the juices and facilitate browning, try cassava flour or tapioca starch instead. If you prefer using cornstarch (hopefully organic!) over arrowroot or other more nutritious options because it is so budget friendly, buying in bulk will last you a long time. Provided that you seal it properly and store in a cool, dark place away from moisture, the shelf life for safe usage is virtually indefinite. (1) How is Cornstarch Made?